Cake & Heels: puff pastry is food of the gods. puff pastry is food of the gods. This is the stuff of legends. 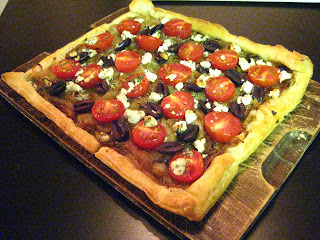 Caramelized Onion, Kalamata Olive, Tomato & Goat Cheese Tart. All I can say is this sucker was deeelicious. 1. Preheat Oven to 400 Degrees. Line a cookie sheet w/ Parchment Paper & lay out thawed Puff Pastry. Poke holes in the pastry so it won't explode. 2. Slice the onions, and caramelize them in a pan using the butter, until they're golden and sweet. Salt and Pepper to taste. Add in the Chives and saute to mix. 3. On the Pastry, lay out the onions leaving a small boarder. 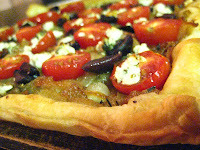 On top lay the sliced tomatoes, olives and crumbled goat cheese. 4. Bake for 30 minutes or until pastry is golden. Enjoy with a nice glass of Riesling and a summer salad!